Online annual reports of chemical companies - nexxar lab. Online annual reports of chemical companies. How do Global Top 50 chemical companies publish their corporate reports on the web? Being innovative is essential for chemical companies. No wonder they are among the pioneers in digital reporting: About one third of all Global Top 50 chemical companies already publish a HTML version of their annual report. In more detail our research shows that currently only five of the Top 50 companies do not publish an annual report. From the 45 companies left, 69% only publish a PDF as digital “minimum standard”, while the remaining 31% offer an online version of their annual report. In contrast to the PDF, digital reports are 100% made for screen. They work on every screen device –from smartphone to full HD display (Responsive Design). Thanks to hyperlinking, online reports as microsites offer the best conditions for connecting content. Another argument for the implementation of HTML reports is that they can be easily found by search engines: If a company only uploads a PDF version of its annual report, it will have no chance of drawing users’ attention. While PDFs are indexed only once, HTML reports with several hundred pages are referenced multiple times by search engines. Besides, users benefit from different features of online reports. They may, for instance, download tables as Excel files, easily create individual charts of a company’s key developments using our Chart Generator tool and compare any given information to what has been disclosed in previous years with just one click. We are proud that five of our customers are among the Global Top 50 chemical companies. The following examples show how report content should be shaped to meet the needs of the digital age. The 2016 Annual Integrated Report is a major milestone in Solvay’s journey towards Integrated Reporting. It underpins the company’s commitment to sustainable and long-term value creation. 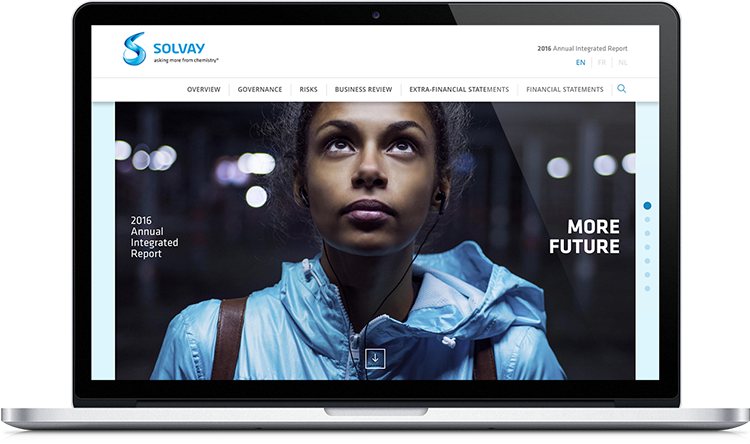 At the same time, the report emphasises Solvay’s commitment to innovation – by choosing nexxar’s Online First approach: online, PDF and print version have been generated from the same source of data (our CMS nxr.edit.). “Less is more” could be the design guideline of the report. The design conveys reduction and minimalism and thus, leaves room for emphasises the actual content. At the same time it works with transparency effects, overlapping elements and colours that create an appealing report style. The Bayer Online Annual Report 2016 sets new concept and design standards in online reporting. The integrated report stands out with its new landing page, animated and interactive elements as well as multimedia storytelling within the magazine. 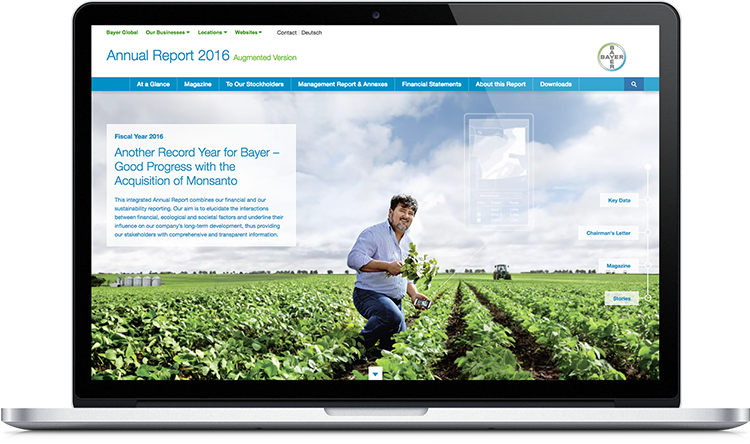 Bayer relies on a waterfall page emphasising four main topics of the current report. The first impression already invites to explore the new content. The key visual of the landing page shows a farmer on his field holding a smartphone in his hand. Implemented as a cinematograph, the clouds move across the blue sky creating a fascinating depth and intensifying the impact of the picture. The effect and the motif arouse interest and point to one of the magazine stories: How digitalisation in farming can help deploy resources efficiently and sustainably. BASF has been publishing their Integrated Report online since 2007, combining financial and sustainability reporting. Due to its many features, technology, and service elements this simply designed report consistently ranks among the best and most innovative reports of the year. Just recently the 2016 Report has won Gold at the BCM Award 2017. 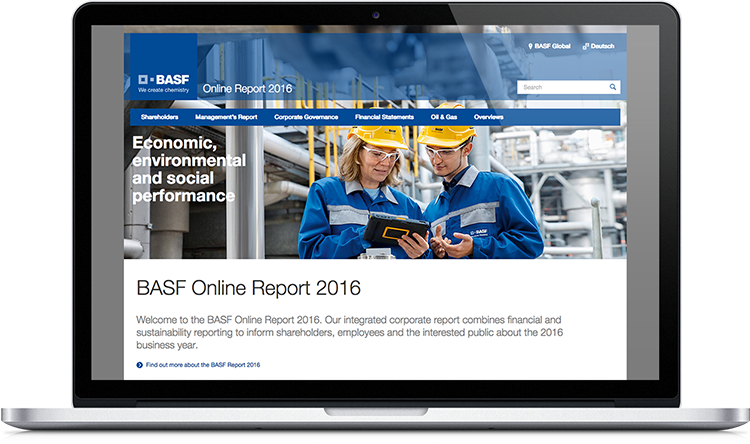 Users of the BASF online report benefit from the clear navigation and various additional features that exploit the full potential of the World Wide Web as medium for reporting. Hence, the online report is in accord with current online trends, such as strong interactivity and individualised information. AkzoNobel is a design-driven company. This is also the first impression of the Online Report 2016. 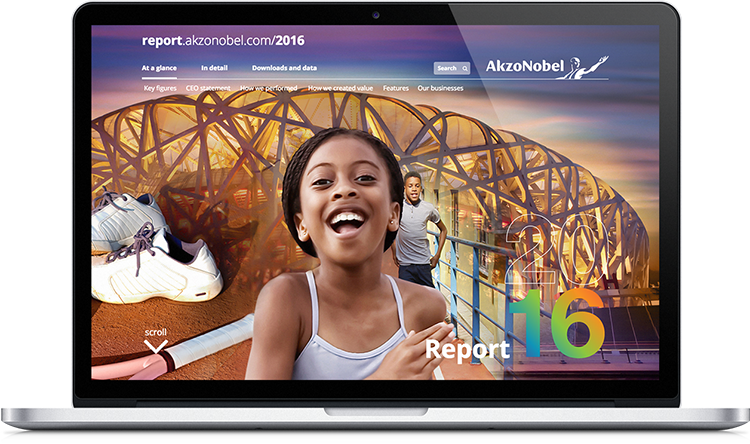 AkzoNobel decided to provide the report information not just as a simple PDF, but as a comprehensive report microsite – optimised through an adaptive layout for mobile devices, as well as a mobile app for iOS and Android. The report sections are presented in different colour schemes. However, one of the highlights certainly is the waterfall landing page: This interactive at-a-glance solution offers users various possibilities to discover the highlights of AkzoNobel’s financial year. 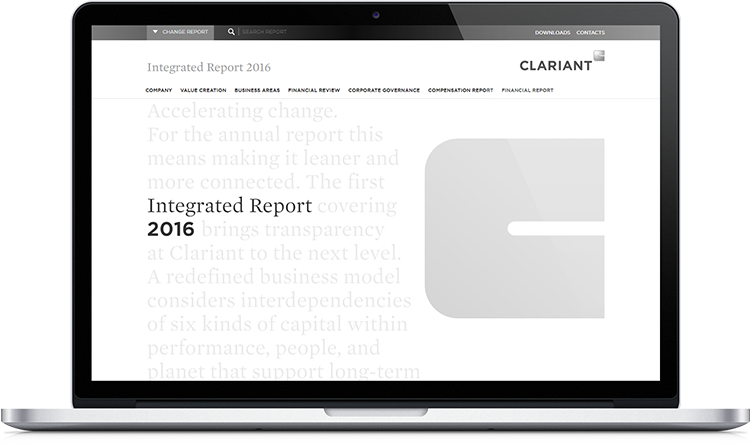 The Integrated Report 2016 of Clariant also follows a digital approach. The concept was created based on the intention to ensure the best presentation and usability of all content on screens, including mobile and full HD display. This meant considering standards of content preparation for the web: clear text structures through hierarchical headings, a lot of white space, easy-to-read font sizes with sufficient line spacing and the use of elements such as lists, charts and graphics to enable a quick comprehension of content. In terms of usability, attention was also paid to a well-conceived navigation for both desktop and mobile devices, the linking of related content as well as a clear report structure. One highlight of the report is the interactive business model. Find more examples of online reports from chemical companies in our Online Report Database.